I admired this terrific retro dresser for months. It was priced too high for me, but obviously for everyone else, too, at a thrift shop I frequent. When it finally went half-price, I decided it was time. Bland and baby-room-ish, I planned to go to the opposite extreme with one of my favorite luscious, saturated colors: hot pink. 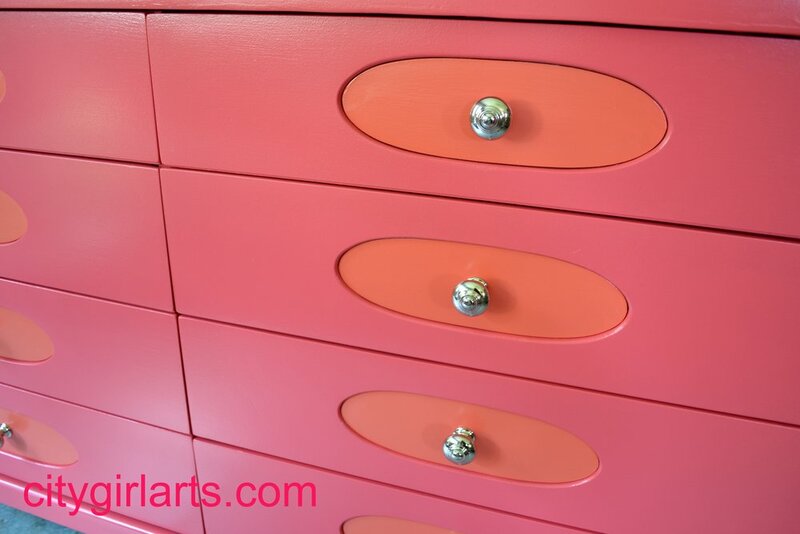 The inserts became bright orange, and the knobs were changed out for a sweeter statement. With or without the mirror, it looks like candy, don't you think? Check out this piece in my Etsy shop. Follow my furniture adventures on facebook. I love reading your comments, and I generally reply by email. Thanks for visiting! Vintage French Serving Cart: Ooh La La!